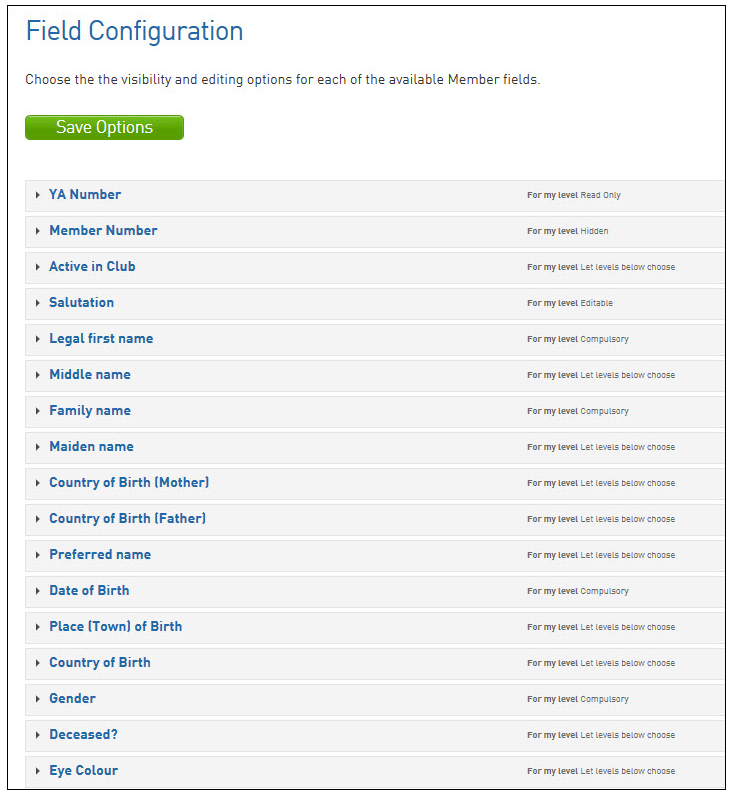 The Field Configuration area allows Associations to select the fields they want to be used in the database across members, clubs and teams. By 'fields' we mean the information you want to store on your clubs, teams and members (eg. name, email address, phone number). The fields used determine the data that is able to be collected on a sport's membership which is vital for administration, planning and research purposes. Setting up the fields to be used is an important first step required when initially setting up your database. If it is the Association's responsibility to configure the fields, this should be done before providing login access to your clubs and teams. In some sports, the national or state governing body will want to determine certain fields to be used at all levels of the database. In this case the Association will not be able to modify the field settings applied by their parent body. 3. The Field Configuration screen will appear. You will see a list of fields that are available to use. Scroll down the list to get an understanding of the types of fields available. 4. To see the options for an individual field, click on the arrow to the left of the field name. 5. This will expand a range of options for how the field can be used in the database. a. For my level: the field setting selected will be applicable to Association administrators. I.e. if you log into the database at the association level, these are the field settings that will apply. b. For levels below: the field setting selected will be applicable to Club and Team administrators. I.e. if you log into the database at the Club or Team level, these are the field settings that will apply. c. Registration Form: the field settings selected will appear on the registration form. a. Let levels below choose: by selecting this option, the Club or Team will have control over the field setting, i.e. whether they want it to be editable, compulsory, read-only, etc. e. Compulsory: It is mandatory for the field to be completed by the Club or Team. The field is editable, i.e. it can be changed at any time. f. Add Only (Compulsory): It is mandatory for the field to be completed by the Club or Team, but once it is saved, it cannot be changed Note: By default, each field is set to 'Let levels below choose' until you change the setting. 6. Select the field setting that you wish to apply to each level of the database (i.e. your level, levels below and/or the registration form) and click on Save Options. 1. To open the options for all fields, click on Expand All at the top right hand corner. 2. To close all field options, click on Contract All. There are a wide range of fields available in Membership for associations to choose from. 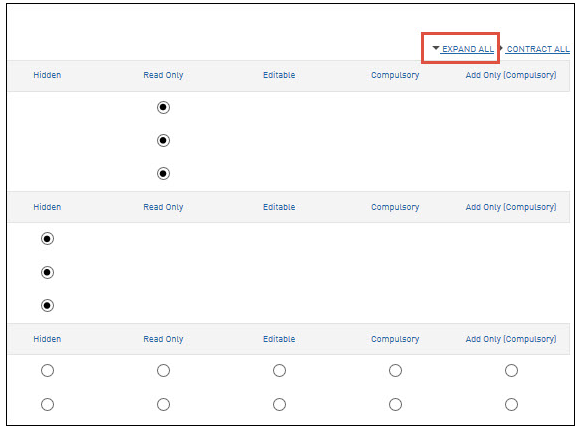 If there are other fields you wish to use that are not provided, you can set up your own Custom Fields. Note: The field configuration options available will differ depending on the level of the database that you are logged in to. If a field that you need is not available to view or edit, you will need to contact the body at the level above you in the database (eg. the Association if you are a Club or the National Body if you are an Association) and request that the field is made available to your level.